Today’s post is guest written by Seana of The Bohemian Blonde. 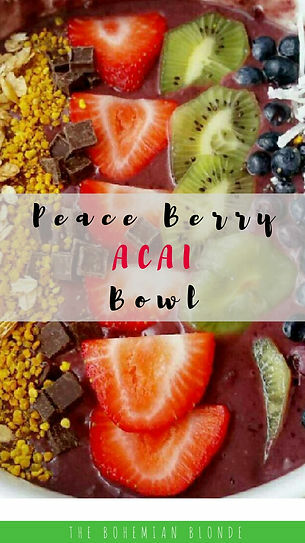 Watch her video below and read on to learn how she makes this delicious Peace Berry Acai Bowl recipe + see how Seana sets her intentions for the morning! 1) Set aside time in the morning to set the intention for the day. I picked a card from my Tiny Devotions intention deck to always set the tone. Today was, energy speaks louder than words” which was all I need to get the good vibes going! Click the image to pin-it + save for later! Place all of the bowl mixture items into a blender and blend until you reach a sorbet/ice cream consistency. Pour out into bowl. It helps to keep the bowl in the freezer so it stays nice and cold while you eat your acai. Next, Add on your toppings + Enjoy! The post Peace Berry Acai Bowl Recipe + Morning Intention Setting appeared first on Tiny Devotions.